Pukuʻi and Elbert, Hawaii Dictionary, 64. After the introduction and acceptance of Christianity many heiau went unused and fell to years of neglect and disrepair. Knowing the locations of these sites allows modern Hawaiians an opportunity to begin reconnection and perhaps in reconnecting they may want to preserve these sites from development. The first of the these known heiau in Kahuku is Puʻuʻala Heiau. 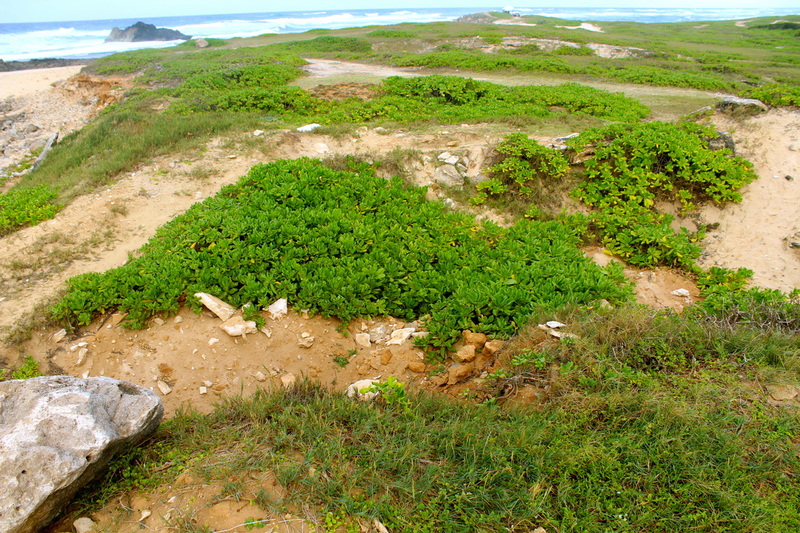 View of Puʻuʻala site from Waimea side of Kahuku. Photo by Estrella, 2014. Puʻu is translated as a hill or mound and ʻala can be defined as fragrant or sweet smelling. In fact this heiau is located on the ridge overlooking what was once Kahuku Ranch, filled with the fragrance of the hala or pandanus tree, which at one time covered large areas of Kahuku. One story tells of Keauaʻula who visited Puʻuʻala and saw some people actively involved in the sports of ʻoʻo ʻihe and moa paheʻe. These sports were often practiced in the worship of Lono during the Makahiki. Pukuʻi and Elbert, Hawaiian Dictionary, 16, 358. McAllister, Archealogy of Oahu, 152. J. W. K. Kauaililinoe, “Kamaakamahiai”, Ka Nupepa Kūʻokoʻa, November 5, 1870. Kalaewila Heiau site estimated to be near slight elevation. Photo by Estrella, 2014. The second heiau of Kahuku is Kalaewila Heiau. Ka-lae-wila or Ka-lae-uwila can be defined as the lighting peninsula. This heiau was built with layers of large coral stones upon a small rise near Kahuku point. A third sacred place, was an alter for the blessing of hula and is mentioned in the oli entitled He Kau Hula or He Pule No Hiʻiaka. Kuluwaimaka explains that the house, which Hiʻiaka calls to, "possesses an ahu built inside for the purpose of blessing such things as hula, lua, ulu, and pūhenehene." McAllister, Archealogy of Oahu, 154. Kuluwaimaka, Mele Manuscript Collection, Bishop Museum Archive, 141. Pukuʻi and Elbert, Hawaii Dictionary, 156. Keanakua Koʻa, Photo from McAllister, Archealogy of Oahu. Keanakua is the name of a koʻa or fishing shrine at Kahuku point, near Kalaewila Heiau. Ke-ana-kua or Ke-ana-akua can be translated as the godly cave. This koʻa was made up of flat coral stones that were placed on end forming an enclosure, and then filled with smaller coral pieces. This koʻa was used as a place to offer prayers and ceremony for fishing, when torrential weather and high seas were prevalent. McAllister, Archealogy of Oahu, 153. Approximate ocean location of Kahoa stones. Photo by Estrella, 2014. There are two stones located in the water about 250 feet from shore fronting Kalaewila Heiau. These stones were called Kahoa. It is not known if these were koʻa. A story is told of a woman who would swim to these two stones and disappear for days at a time. 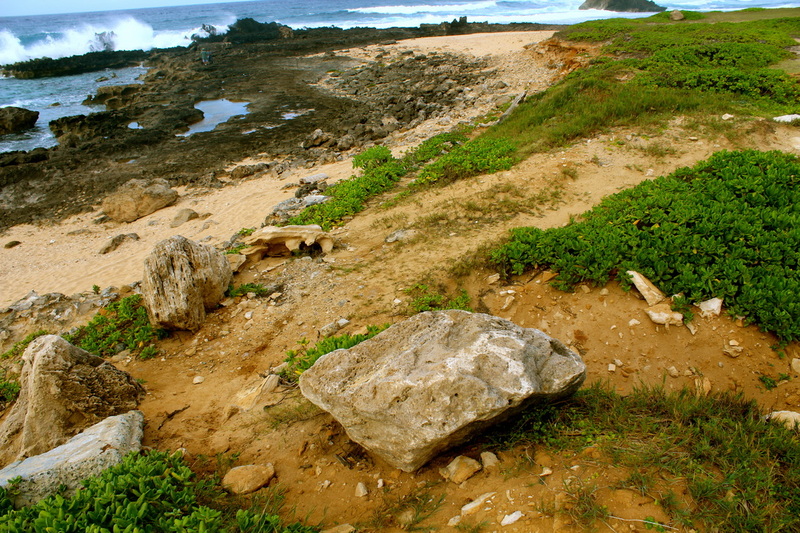 Some say that this woman used these stones as an entrance to a land called Ulukaʻa or Kahuna Moku. This may have a connection to Kānehūnāmoku, "a land of Hawaiʻi not visible to man and home to the gods Kāne and Kanaloa", but there is no substantial evidence to support this. Beckwith, Kepelino’s Traditions of Hawaiʻi, 189. Estimated location of Keanakua Koʻa site. Photo by Estrella, 2014. 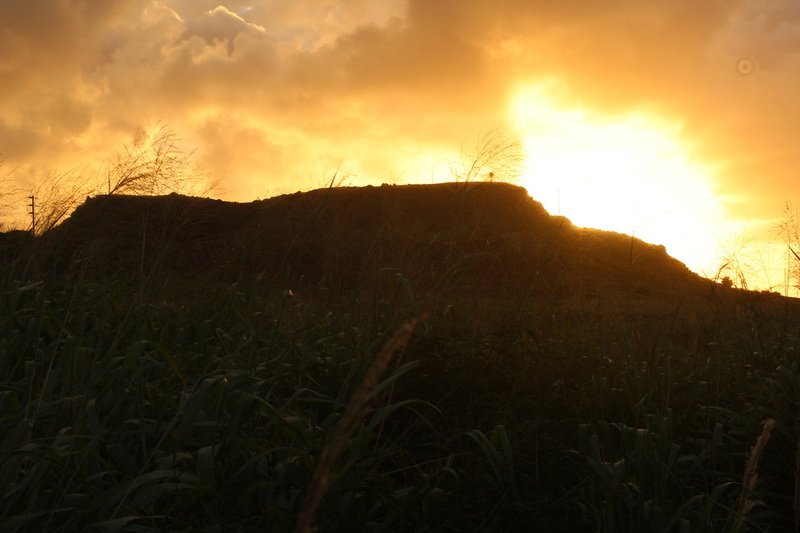 Puʻuʻala Heiau, Hauʻula side at sunset. Photo by Estrella, 2014. 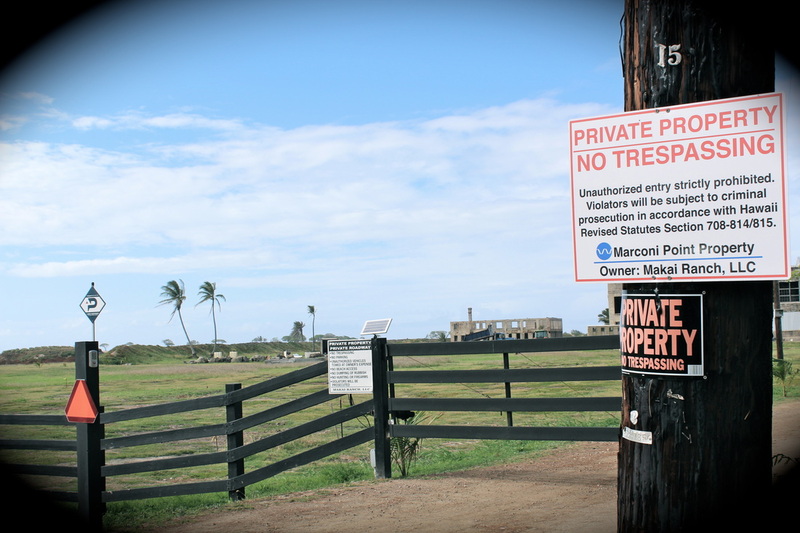 Access limitations to koʻa and heiau through Marconi Road. Photo by Estrella, 2014.